Hey there. It's time for another giveaway! But this is one is going to be a little different the others I've had. I've been in Bioshock mode for the past few weeks. I've been playing Bioshock Inifinte and it's been one hell of a ride! I promised the kids that they can watch me play, since they've seen me play the first two Bioshock games and have an interest in the Bioshock series. Last night, I finally got through the game and it brought a smile that my 14 and 11 year old were discussing the possible meaning of the ending. Anyways, I decided that this giveaway will be Bioshock related and I've come across 2 prizes that should make anyone who loves the Bioshock series happy. The prizes up for grabs are the Bioshock Ultimate Rapture Edition OR The Art of Bioshock Infinite Hardcover Book! The winner will get to decide which on the prizes they would like! The Bioshock Ultimate Rapture Edition is the first two Bioshock games PLUS their downloadable content. That's $40 worth of DLC! The Ultimate Rapture is available only for the PS3 and Xbox 360 (sorry PC gamers). I personally loved the first two Bioshock games and to get 2 games and their DLC in one awesome package is a great deal! If you have not had a chance to play the games and visit the city of Rapture, you simply MUST check it out! If you are a behind the scenes kind of guy (like myself) you're going to want to have the Bioshock Infinite Art Book! 183 pages of art and early sketches of the characters and locations from the world of Columbia! The art book is from Irrational Games so you know that the sketches within the book are from the minds of the developers themselves. If you have played Bioshock Infinite then you know that the game is simply beautiful. The landscapes, the characters, the action... it all flows seamlessly and you can find out how the developers got there by following thier sketches and their train of thoughts. A must have for Bioshock Infinite fans! Now, on to some of the giveaway details. The giveaway is open to everyone! But there are some exceptions... The game is available ONLY to US and CAN residents. If the winner is from Canada, you may be asked to pay for additional shipping costs. Please keep that in mind before entering. The artbook is available to anyone anywhere (Thanks Alex for pointing that out!)! The giveaway will run from now until May 2nd and the winner will be announced on May 3rd. The only mandatory entry is to leave a comment with which prize you would like and why. So what do you guys think? If I had a choice, I would choose the art book over the game, but that's only because I've already been to Rapture and I'm a little bit of an art geek (Gustav Klimt being a personal favortite.) Good luck everyone! Later! I would choose the art book. My husband already has the collectors edition of the game and he is currently working on his Bachelor's in Game Art so he would love the art book! I would choose the Bioshock Ultimate Rapture. I have never played the series so it would be a great way to start with the entire package deal! Hey there Brit! The artbook would make a GREAT gift for an Art major! Good luck! Ultimate Rapture, after plaything through Infinite, I'd love to travel back to Rapture. Plus I never played any of the dlc. I would choose the Ultimate Rapture Edition because I have not played the second game, nor any DLC for any of the Bioshocks. Thanks for offering such a great giveaway! The art book, because I love this game and I have the first two games and all dlc. I'd choose the art book since I already have the games. BioShock Ultimate Rapture Edition because I've been meaning to play these. I've only played a bit of the first game, so I'd definitely choose the ultimate rapture edition! I would pick the Bioshock Infinite Art Book! I already have the first two games for PC. :) Thanks! I choose the Art of Infinite book. Yes, that'll do. I'd choose the art book! I would choose the book. I already own the first two and, like you said, the are is absolutely fantastic. I would choose the Ultimate Rapture Edition. I'd love to revisit the first 2 games. the art book. as much as I LOVE the first 2 games I have them both, even though I want to play the dlc I'd like to see the art book, as bioshock infinite was amazing too. Id love to win the game, I've watched people play it but of.actually like to own it for 360. The bioshock games sound good! 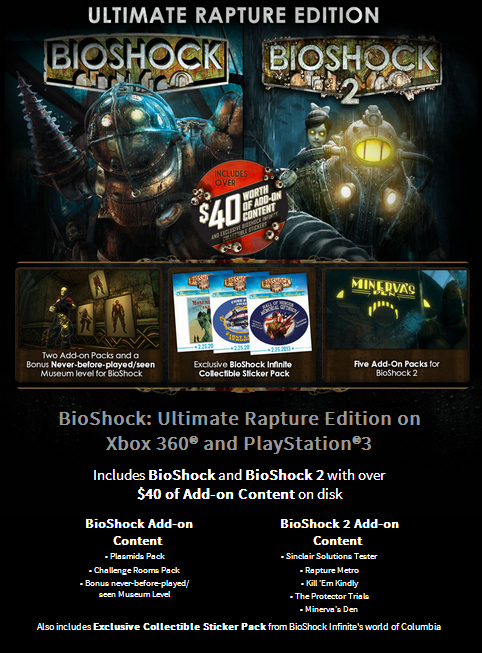 The Ultimate Rapture Edition Bioshock, because my brother's bitrthday is coming up soon and I would love to get him this, we only got to play the first one at a friends house because we never had an xbox till recently. 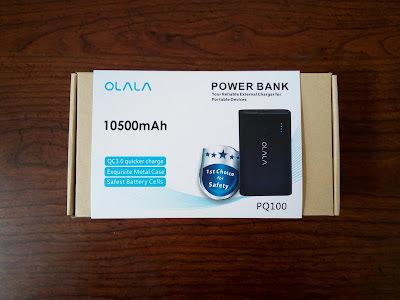 Thank you for this awesome giveaway. Definitely the Infinite art book because i can't afford it and have played the games already. That's not even mentioning the fact that the Infinite art is absolutely gorgeous, so much so that unrelated to Bioshock's awesomitude it would probably be an amazing book by itself. The ultimate rapture edition for sure because I have never played the first 2 before! Hey there Will. The game is stunningly beautiful. I would opt for the art book too! Good luck! I hear ya, Jessica! Good luck! The Art Book. I love collectors items! I'd choose the Bioshock Infinite art book because I already have both Bioshock and Bioshock 2 plus all the related DLC I care to own. I'd go with the art book, since I already own the first two BioShock games, and I just like the world of Infinite better overall. The Art Book for sure it would look great on my front room table! 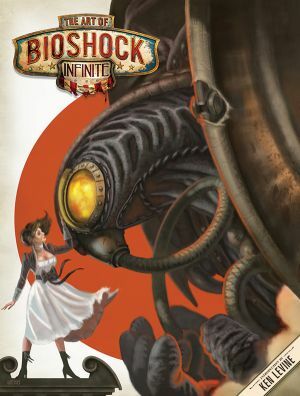 I will choose the Bioshock Infinite art book because I already own Bioshock 1 and 2 + all DLCs. The art book will be a perfect fit in my Bioshock collection! Hey there Anatidae! You've been missing out on some very good games! I love the Bioshock series and it's story line. I'd love the art book. It looks so cool. The games for PC, I have yet to play them. I would choose the art book because I love art and it looks awesome.... plus I own the rapture edition. Definitely the game because where you are an art geek, i am a gamer geek myself! The Bioshock Ultimate Rapture Edition for the PS3 because of all its awesomeness! The book. I'm an artist at heart. The Rapture Edition so I can replay the greatness that is Bioshock. The Rapture Edition for the Xbox 360 for sure. I like the artbook, but you know, reliving Bioshock is just SO much better. The game!! I´ve been watching gameplays ever since the game hit the market and would love to have it! Bioshock Ultimate Rapture Edition for the PS3 because I have always wanted to play it and never got the chance. I would love to own the Bioshock Ultimate Rapture Edition!! I want the Bioshock Ultimate Rapture Edition for XBOX because I really want to play Bioshock 2. I played 1 and loved it! I'm in it for the Bioshock Ultimate Rapture Edition for PS3 because I haven't played the games yet. I would choose the game! The book is amazing, but I want to play! TOUGH CHOICE!! But, I'd have to go with the game. Love the games, and this would be a nice one to add to our collections. Bioshock is awesome! I'd like to have the game because it looks fun to play. I would deff. pick the game! I have heard great things about the games but I have not been able to get around to buying them (car troubles, ugh! lol) I would love to play the games though! I'd be all over the artbook! Already have 1 and 2 and would love to see that art work.